“Deep in the heart of a hollowed-out moon the First Doctor finds a chilling secret: ten alien corpses, frozen in time at the moment of their death. They are the empire’s most wanted terrorists, and their discovery could end a war devastating the galaxy. But is the same force that killed them still lurking in the dark? And what are its plans for the people of Earth? This book was a combination of two amazing things: BBC’s Doctor Who and And Then There Were None by Agatha Christie. I’ve read And Then There Were None upwards of three or four times, and each time I read it I love it even more. It’s unsettling and incredibly suspenseful and absolutely creepy, but it grips me and doesn’t let me go until I’ve flipped over the very last page. When I found out that Ten Little Aliens was influenced and inspired by one of my all-time favorite mystery novels, I couldn’t believe my luck. This book was practically made for me! I absolutely loved everything about it. It’s like an episode of Doctor Who in book form, which is essentially my dream come true. It’s incredibly suspenseful, even shocking at times. The twists are so unexpected that I seriously gasped out loud several times while reading this novel. One of my favorites aspects was the choose-your-own-adventure-ish set up that takes during part of the climax. It adds to the creepy, suspenseful tone of the story and makes you feel as though you’re actually part of the action. I could go on and on about this book, gushing about why it’s SO AMAZING, but I think I’ll stop there before I give away any possible spoilers! I can easily say that this is one of the best books I have read- and most likely will read- in 2014. If you are a Whovian or at all interested in science fiction, I HIGHLY recommend this book. It’s part of a long series with a book for each Doctor, and I cannot wait to dive into the rest of them! Would I recommend it to a friend? : YOU BET I WOULD. Do you like Doctor Who? Have you read any good books based on it? Let me know in the comments section below! Great review. I’ve recently been getting into reading Doctor Who books. 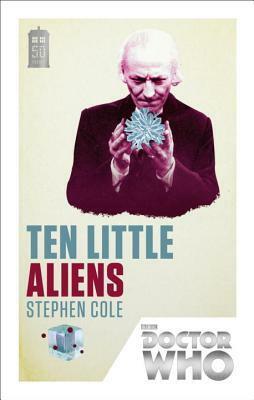 Mostly I’ve read books about 10/11/12 but I’ve just started to read some books about the i earlier doctors. I really like Only Human by Gareth Roberts (9), Silhouette by Justin Richards (12) and The Blood Cell by James Goss (12). I found Beautiful Chaos by Gary Russell to be really moving as it looks at the nature of memory which is so apt in terms of what happened to Donna Noble. LOVE DOCTOR WHO! So glad that there are so many Doctor Who fans out there 😀 And now that you’ve done it and name-dropped Doctor Who I’m definitely going to read this! (Plus that episode with Agatha Christie and Doctor Who, that one was SO awesome!). A book that reminds me of Doctor Who is The Hitchhiker’s Guide to the Galaxy – it is absolutely crazy in the same way Doctor Who is!